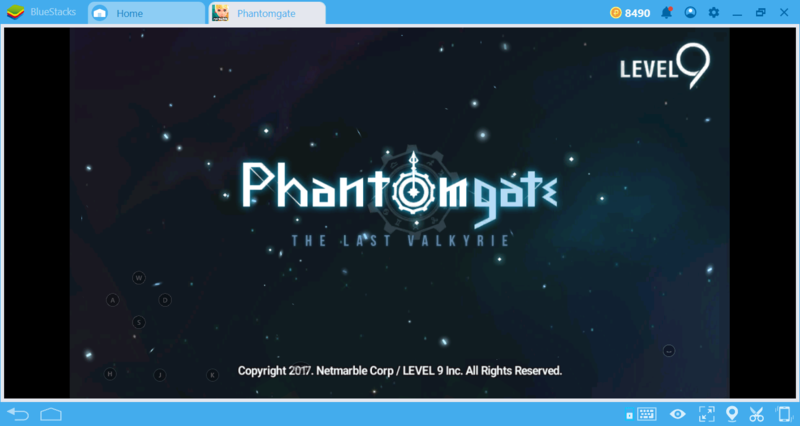 Phantomgate: The Last Valkyrie released its global version only two months ago but we can say that it is already very popular. 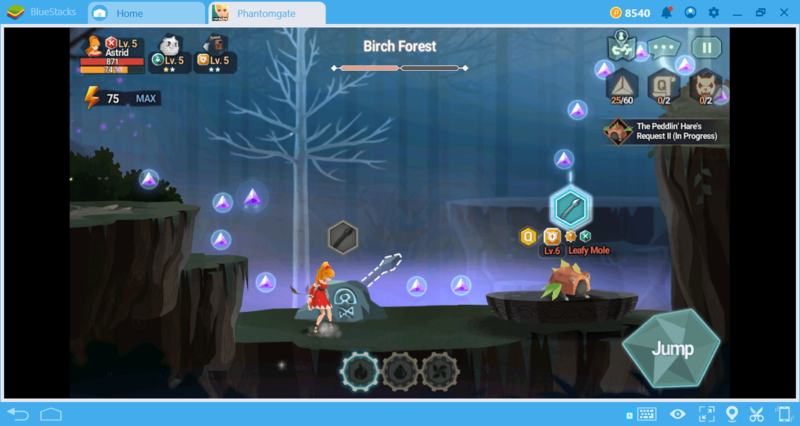 Stylized graphics, 2D platform gameplay, and gacha mechanics: It contains everything you need for a long-lasting and enjoyable gaming experience. But for beginners, this journey can be a bit challenging because the game offers a combination of different mechanics. We prepared this guide for them: Read on to learn how to start walking among the gods. The Gacha Part: If you’ve played Knight Chronicles or Idle Heroes before, this part will look quite familiar. The creatures that you have to collect in Phantomgate are called “phantoms” and there are hundreds of them. 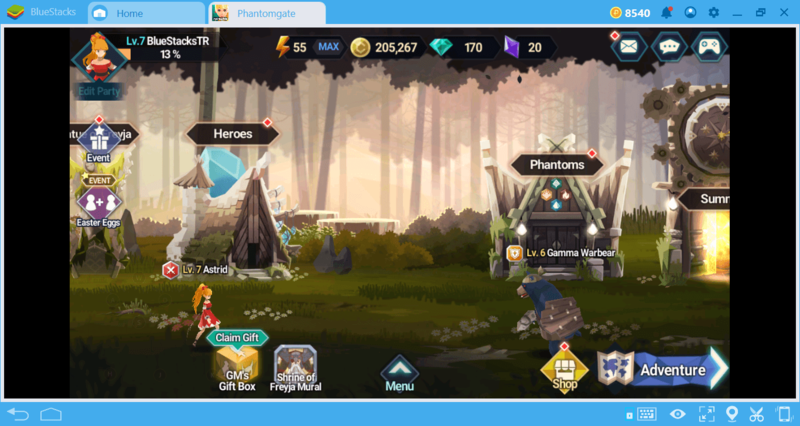 There are multiple methods of collecting phantoms and we discuss this in detail in the BlueStacks Guide for Phantoms in Phantomgate. The Platform Part: Phantomgate’s main story missions are designed in the form of a platform game. We’re sure you’ve played Super Mario before: This part is played exactly like that, on a 2D background. There are things you have to collect, missions you need to complete, and enemies you must fight on each map. When you complete all the missions in a map, you can finish the chapter by fighting the boss. 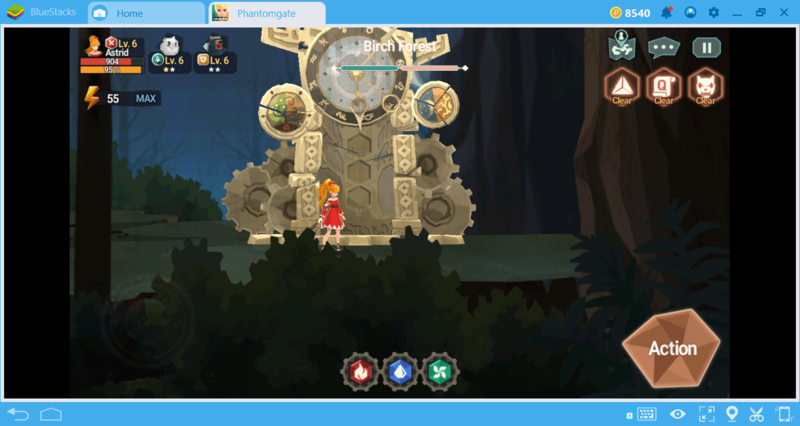 The Turn-Based Part: Phantomgate battles are turn-based. 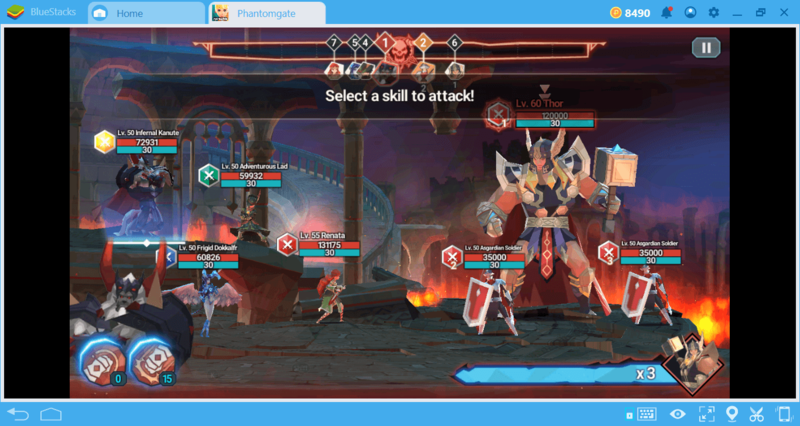 It seems Netmarble used the exact battle system of Marvel Future Fight in Phantomgate too. You fight on a 2D background and the attacks are done in turns. You have limited control over the battle, but if you know how the system works, you can get an advantage on the battlefield. We will discuss this issue further in the Battle System Guide. When you start the game for the first time, you will fight against Thor. Way to start an adventure! 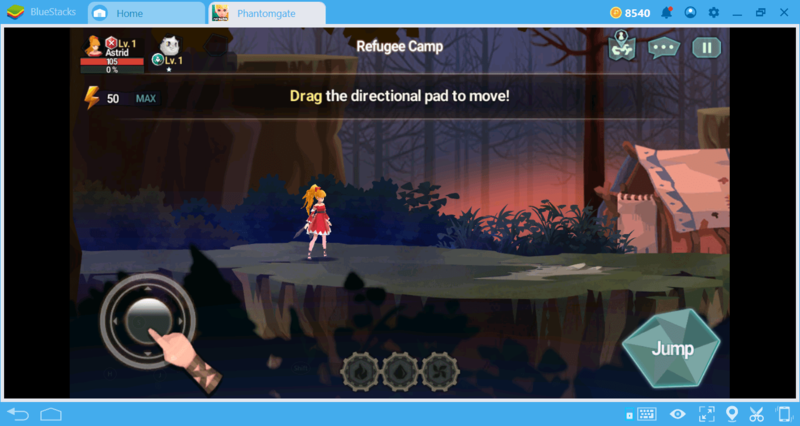 This part is a tutorial mission and allows you to learn how the battle system works. You also start to learn the story in the game. We recommend that you watch all cinematics without pressing the “Skip” button. Phantomgate has a good story and if you know what’s going on, you will enjoy the game more. After the Tutorial is over, you will begin to control Astrid, she is your main hero (but not the only one). Your starting point will also be your home screen and base, so you’ll come back here often. 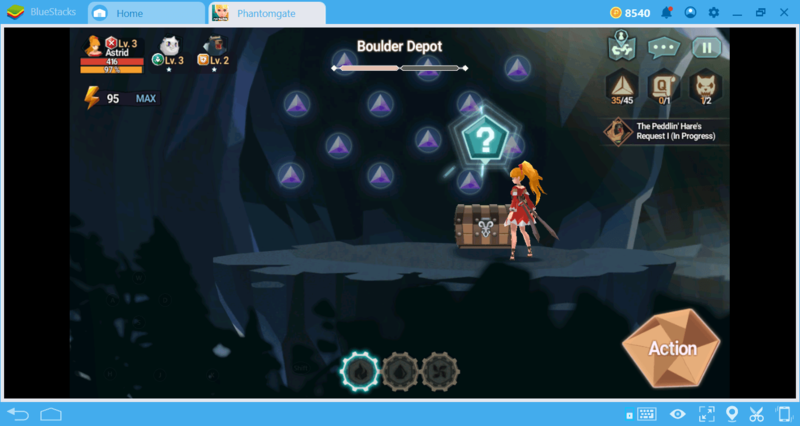 Buildings on this screen will be used to start new adventures, summon phantoms, strengthen them, and get buffs. As the story progresses you can unlock new buildings. In this context, the two most important buildings are “Summon“ and “Phantoms”. In the first, you can summon new phantoms, while in the second you can strengthen them. When you have your first mission, there will be only one character in your party: Mini-Ming. It is a cute cat and has healer abilities. As you level up, you can add new phantoms to your party and become stronger. 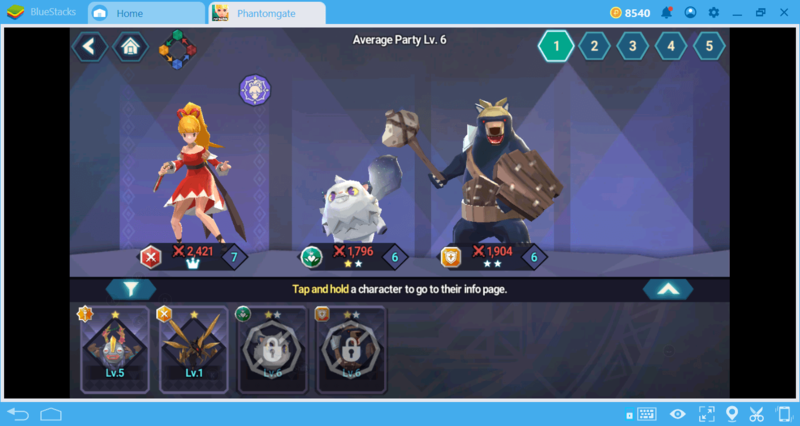 Each party can have a total of 4 characters and you can create up to 5 different parties. There must be a hero in your party like Astrid, but you can pick the other members freely. You can add the phantoms you found or summoned to your party. It is possible to make them stronger by various methods. Your goal here is to create a balanced team: Take a look at the guide we have prepared about phantoms to learn more about this system. The Phantomgate story consists of 6 chapters and each one has 5 sub-chapters. So you can complete 30 missions in total. Completing missions allows you to get XP points, new phantom essences, and evolution runes. You can also unlock some buildings and features only by completing missions. So start the main story missions without delay. These missions use 2D platforming mechanics as mentioned above, and look quite impressive because of their stylized graphics. We can say that they look almost as good as Child of Light, which was developed by Ubisoft for PC a couple years ago. You have three missions to complete on each map: Collect Phantom Soul Fragments, complete quests, and defeat phantoms. Let’s start with the first: The airborne triangles you see on the screen are phantom soul fragments and you need to collect as many of them as possible. These are used to raise the levels of your phantoms. Therefore, even if you have collected the desired number, continue collecting: The more, the better. The quests are quite simple, and collecting certain items is often enough to complete them. Sometimes you’re asked to kill the rogue phantoms too. 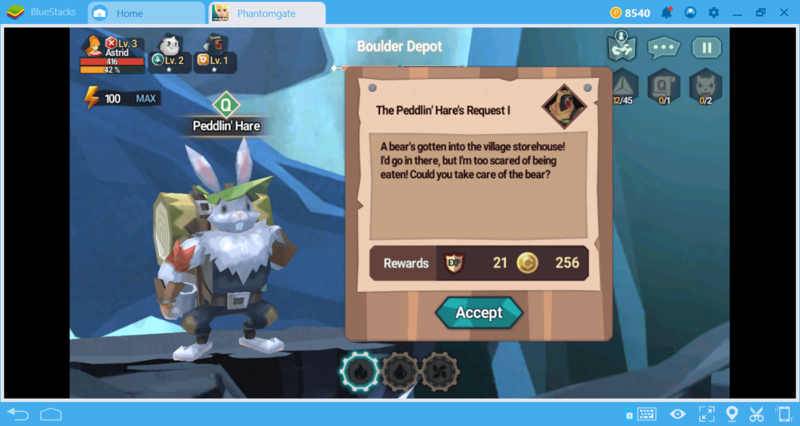 The quests are easy to complete because they are automatically finished after doing the asked thing, so you don’t have to go back to the quest giver. Rogue phantoms are the enemies that roam on the map. 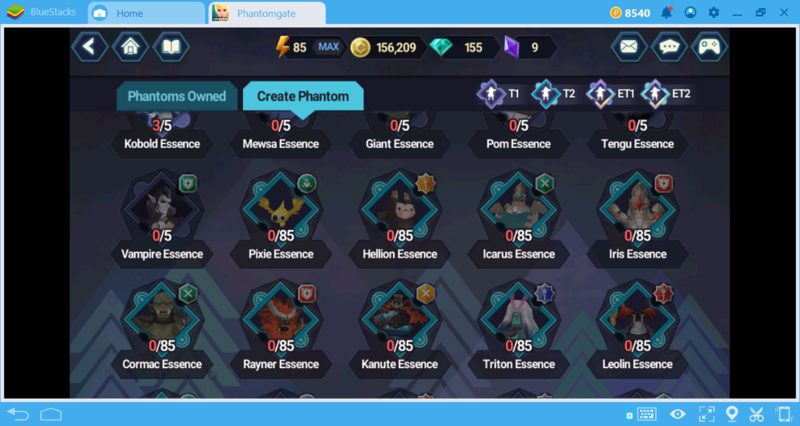 When you defeat them, you gain “essences” that you can use to get new phantoms. You also need to open a door to fight the boss at the end of the map. The gems required for this job drop from these phantoms. Look at the bottom of your screen: If all your slots are full, this means you have killed all the rogue phantoms on the map, collected all the jewels, and ready to fight with the boss. However, you can continue to explore even after completing all the missions on a map. Some hidden areas include loot chests, and if you find them all, you get additional rewards. 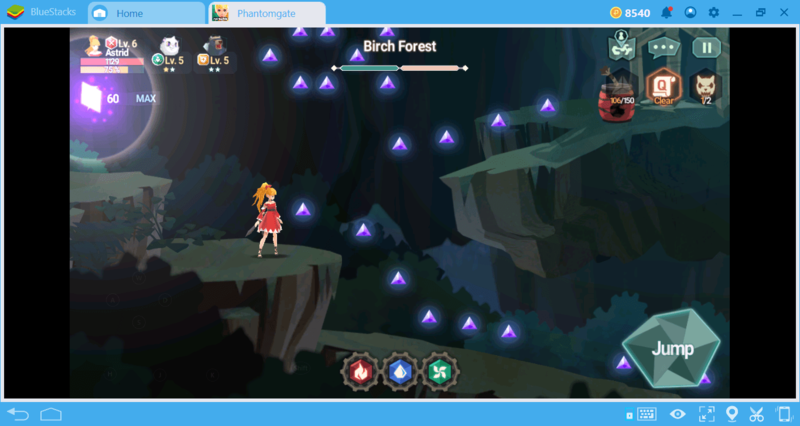 For BlueStacks users, navigating through the maps will be easy: Move with WASD keys, jump with Space, and collect items with your mouse – that’s all. As you complete the missions, the story will progress and you will be able to expand your phantom army. You can be sure that there will always be something to do, Phantomgate never lets you get bored and keeps giving you new goals. The combination of different mechanics make it a perfect hybrid: if Super Mario and Idle Heroes were married, they’d make Phantomgate babies. Haha, so now that the conjugal jokes are out of the way, you’re ready to start your adventure in this unique game, but you still need help: Don’t forget to read the other Phantomgate guides we’ve prepared to be able to walk safely among the gods. Good luck!